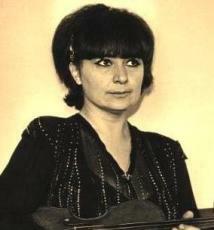 Liana Isakadze is a Georgian (Russian) violinist, conductor, and teacher born (in Tbilsi) on August 2, 1946. She is very well known in Europe and Russia though not in the U.S. She began studying music at age three. One of her first teachers was Leo Shiukashvili. She was to have been a pianist but became a violinist by pure chance. Isakadze first performed in public (as a violinist) at age 7 and by age 9 had already soloed with the Georgian State Orchestra. Her first recital took place when she was 10. She started winning prizes at competitions when she was 12, including First Prize in the 1970 Sibelius Competition (Helsinki, Finland.) She graduated from the Moscow Conservatory in 1968. She was 22 years old. Her principal teacher there was David Oistrakh. Isakadze has been concertizing in Russia and Europe ever since. Ironically, Isakadze and her cellist brother – Eldar Isakadze - were rehearsing the Brahms Double Concerto with Oistrakh (as conductor) in Amsterdam in 1974 when he suddenly died while there. In 1971, she became a soloist with the Moscow Philharmonic (1970-1994) and ten years later was made head of the Chamber Orchestra of Georgia (a province of the Soviet Union at that time.) She led this orchestra for fifteen years. In 1988 she was named People’s Artist of the USSR, the youngest to be so named. Isakadze has also received various other honors from the governments of various countries. For over two years, she even served as a Deputy in the Soviet Congress of People’s Deputies (March 1989 to December 1991.) She has resided in France and Germany for many years and presided over various music festivals in Georgia, Russia, and Europe. She has also given Master classes at the Mozarteum (Salzburg, Vienna) among many other venues. Her recordings are very numerous and YouTube has many videos of her playing. Here is one of them - a small slice of a nice violin concerto by Georgian composer Otar Taktakishvili. For many years, Isakadze played a Stradivarius violin from the Russian State collection. I do not know what violin she is playing these days. This is violinist profile number 260.